I don't seem to have much luck when it comes to making loaf bread lately. I always have this problem with dough taking too long to fill up the bread pan during the second rise. Most of the time, the dough rose beautifully within an hour or so, during the first proof. But, after shaping, it took forever before the pan is 80% filled. There was not much of an oven spring too...the bread didn't expand much upon baking. I experimented with different recipes...using straight dough or tangzhong (water roux) method. At first, I thought maybe the dough is too little for my pan, so I even tried increasing the portion, even then, the dough just couldn't fill up the pan. It soon occurred to me that I should just go back to the very basic of bread making, that is, to make a simple white bread. I went on to choose this recipe using the gelatinised or scaled dough method. Besides the gelatinised dough, an overnight sponge dough is also called for in the recipe. Both have to be done the night before, as they need to be chilled for at least 12 hrs. They were rather easy to prepare, as all that was required was to mix the ingredients to form a rough dough, no kneading was required. Most importantly, the dough proof very well during the second rise. I am quite sure it has got nothing to do with the yeast as I didn't use a fresh pack. My pullman tin was 80% filled within 50 minutes. It has got nothing to do with the room temperature either, as the weather was just like any other day, around 29 ~ 30 degC. I was very so pleased with myself when I removed the bread from the pan! What a lovely loaf...with straight sides and yet the edges are slightly rounded and not too sharp. This means the dough was sent into the oven at the right time...if the edges are razor sharp, it implies that the dough was slightly over-proof. The crumbs was very soft and light, and the crust was so thin that I wouldn't even consider it as crust. The bread was so tender that a slice would flopped over if I slice it too thin. 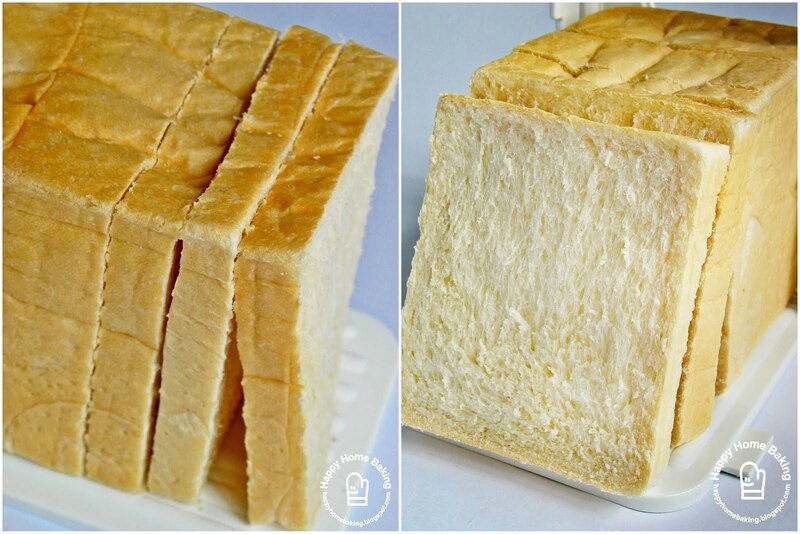 I tasted one slice of bread everyday, plain, without any jam or butter. The very first slice, a few hours after the bread was baked, was cottony soft and I could even feel the moisture in it. It must be the most delicious slice of bread I have ever made. It was also the first time my untrained palette could detect this nice fragrant from the wheat flour! It tasted better than any store-bought bread. The second slice, 24hrs later, tasted good...just as tender and soft...comparable to any commercial loaf. The third slice, 48hrs later, had aged a little. It felt heavier, and the surface was a little dry. Nevertheless, I still think it tasted good. I had the last piece 72 hrs after it was out from the oven. The bread had aged further. The texture was just like any commercial bread that was just before its shelf life. Even though I could still eat the bread without having to toast it, I had to spread some kaya to make it taste better. There is no doubt that this recipe is going to be a keeper. It is the perfect recipe for me...the dough is not too difficult to knead by hand, and the finished bread could stay soft for days. Mix bread flour in (B) with instant yeast. Add water and mix to form a rough dough. Cover dough let it proof for 30mins. Wrap dough and refrigerate overnight. Note: only 60g is required. Bring back to room temperature before using. Mix together bread four, milk powder, caster sugar, salt and instant yeast in a mixing bowl. Make a well in the centre, and add in water and overnight dough. Knead to form a rough dough. Knead in gelatinised-dough. Transfer dough to a lightly floured work surface. Knead the dough till smooth. This should take about 10mins. Knead in the butter. Continue to knead the dough until it no longer sticks to your hand, becomes smooth and elastic. This should take about another 15~20 mins. Do the window pane test: pinch a piece of the dough, pull and stretch it. It should be elastic, and can be pulled away into a thin membrane without tearing/breaking apart easily. Place dough in a lightly greased (use vegetable oil or butter) mixing bowl, cover with cling wrap and let proof in room temperature (around 28 to 30 degC) for about 60mins, or until double in bulk. Remove the dough from the bowl and give a few light kneading to press out the gas in the dough. Divide the dough into 3 equal portions. Roll each dough into smooth rounds, cover with a damp cloth or cling wrap and let the doughs rest for 10mins. On a lightly floured work surface, flatten each dough and roll out to form a longish oval shape. Starting from the shorter end, roll it up swiss-roll style. Leave the doughs to rest for another 10 mins. Flatten each dough and roll it out again to form a long rectangle (around 30cm x 10cm). Flip the dough over and roll up swiss-roll style, roll up as tightly as possible. Pinch and seal the seams. Place the three doughs, seam side down, in a well greased (with butter) pullman tin. Cover with damp cloth or cling wrap and leave doughs to proof for the second time for about 50~60mins, or until the pan is 80% full. Cover the lid (well greased with butter) and bake at 220degC for 35mins. Unmold immediately and once cool store in an airtight container. HHB, you are tempting me again, guess I have to try this recipe soon, I am backing off with bread making cos of the kneading but this one, I must try :). This is a super successful attempt! Perfect square and nice crumbs! It's inspiring me to try this recipe soon. I did have the some problem that the dough sometimes takes more than an hour to proof at the 2nd proofing, really don't know what's wrong. This recipe no doubt is a good one as you've prove it brilliantly! Thank you so much for sharing! Again, your bread looks so good even though it's the basic. I have problem with basics to start with! May I know how long do you take to knead your dough? Do you have muscle aches after that? :p I really salute you for kneading by hand, I never bother with that! I dunno if it's my problem ... I think the final pic of the slice of bread you showed looks odd ... as in the shape!? How come the bottom part (as depicted in the image) looks concave? Visual deception? Oh, yes! I've tried making buns but not loaf by combining 12-hour sponge and scalded dough. Will blog about it. Thanks for reminding me! HAHA! There are in fact two backlogs about it! HAHA! We def share this commonality: Our love for bread is forever. HAHA! I'm a bread person, too! Throw Asian-style soft bread or rustic European bread at me, I'll be more than happy to finish the bread up for you! LOL! Hi HHB, i've also tried the gelatinised method and i must say the results were good. I just made a batch yesterday and keep aside 2 buns to see the softness can last till 3rd day...and the dough was so much easier to handle. Jess, you should try this, the dough is not as wet and sticky...it is easier to knead as compared to tangzhong dough, and I could always get to the window pane test. Grace, I have problem especially with tangzhong method during the second proofing. I dont know why, maybe it is the way I made the tangzhong? (1) I have warm hands, so the dough tend to feel warm after kneading for so long, and the yeast started to activate and I could see small bubbles forming. (2) I have a constant nagging pain on my shoulder and neck area, for the past few years. I usually need to use sanoplas after I made bread, and I will feel as though I am 'Batman'...can't really turn my head to my sides too much, it hurts! Bee Bee, you can just leave the overnight sponge dough in the fridge, you don't have to worry about it. The only downside is, you need to prepare it the day before, bad for people like me who tend to bake on impulse ;) and sometimes, I may not have the time to make the bread the following day as planned. It's a square!! Very nice loaf, looks soft and fluffy. I am glad someone else other than me prefers this over the overrated tangzhong method. I've always had fantastic results with this method. Tangzhong is decent but not great. Well done! It's good that you don't give up easily! That's the essence of baking. Don't get it right? Try and try again! The feeling is wonderful when you succeed! Btw, that is an awesome-looking loaf! The bread looks so soft!! It came out so beautifully too. 1st time visit to your blog. I love it so much. I have link you, hope you don't mind. I do have the same problems when making white toast and been trying for so many time but failed. I will try yours soon. I always had the same problem - 1st proof was excellent, then the 2nd proofing was forever and ever, and NEVER RISE further during baking. Will try your method this time. Do you know if I can make this into sweet bun with fillings? the crumb on your loaf looks amazing! dear HHB, Thank you so much of sharing this basic loaf recipe, now i can use my pullman tin (use it not more than 3 times) to bake this perfect loaf! Have a nice day. Wingzy, I have problem proofing tangzhong during the second rise, but this one proof really well. The bread keeps well too, probably because of the sponge dough. Anne, there is a wholemeal version, I have yet to try it. 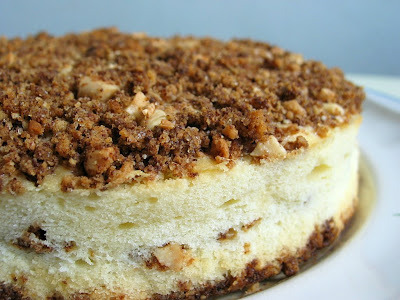 Sonia, I think you will like this recipe, happy baking! This is a super duper soft pullman loaf! I am a new visitor to your blog and like everyone here, your wonderful looking pictures and the joy you demonstrate through your blog have tempted me to pursue baking as my new hobby. I recently tried your matcha swirl loaf bread recipe and I'd say it resembled yours 70%, but my bread was more dense and less fluffy than yours. I wonder if it has to do with me using all purpose instead of bread flour? I also want to know how you keep your bread. I usually keep them in a sealed plastic bag to prevent it getting dried, but I find the process of waiting for the bread to completely cool down usually already dries it out. Please advise. Finally, I'd like to know for your recipe above, if I don't have milk powder, can I substitute with milk? If so, what would be the corresponding portion? I've baked some buns yesterday, but the texture are not soft. Luckly, you have written this method, I should try this and see whether I managed to get the soft texture on my buns or not. Thanks for your recipe. Hi Pandora, you need to use bread flour, which has got a higher protein gluten. I usually leave the loaf bread to cool off for about 30~45mins or so (shorter for buns), before storing in an airtight container. Hi hhb, yr raving is very persuasive, makes me feel like i wnt to go bake a loaf now lol! Can u tell me where i can get a pullman tin pls? MJ, I got my pullman tin from Sun Lik. You can also get it from Phoon Huat. Oh gosh, it is soooo fluffy and in perfect shape. Tks, will look for it when i nxt go to PH. Thanks very much for taking the time to explain the differences to me. Now I understand. I didn't notice the distinct differences in covering the whole bread tin and not totally covering it. Gee, I'll have to examine my loaf the next time I baked it. I've said this before and I'm saying this again. You are a woman with great perservances, kudos to you! Tried making this yesterday...it was very good. We all loved it :) Thanks again! Love the look of your bread... so much so that I have decided to try it myself !! Would you consider making a wholemeal version anytime soon? Thanks for sharing ! your bread looked so nice, so as your "Paah Mee"!! they made my tummy rumbling at 12.30am!!! 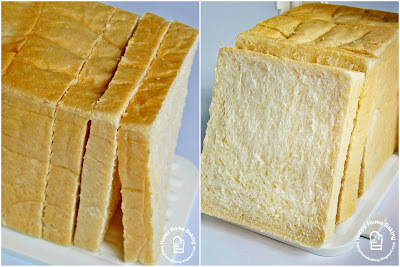 I would like to try to make the bread also, but what is the size of the pullman tin that u use to bake this bread? If I am using a bigger tin, how should I convert the ingredient? Do you know of any conversion table for this? THanks! hihi! can i ask where did you buy your pullman tin from? in sg? freshly baked bread looks so delicious! Hi, yes I got it in sg. Hi Ying, my first pullman pan was from phoon huat and the second one was from Sun Lik. The bread looks soo soft! just like the ones from the bakery. I can't wait to try this recipe!! Ar.. I shall take a look at phoon huat then! Hi Amanda, I have not tried replacing it with wholemeal flour so I am not sure how it will turn out. I just want u to know that I'd baked this loaf today following ur recipe and loaf turned out great success! As I do not hv a pullman pan, I baked it in a 6" cake pan and the result was really very good. This recipe is clearly a keeper for me. U know, half way thru the baking, the loaf continued to rise and rise and it was tall by the time it was completely baked. And like u said, the texture is very tender and the crumb was soft and light with crust so thin and fresh. Since, I used an open pan, the top crust was nicely brown in colour and look so so delicious. This loaf definately tastes better than those from the commercial bakeries. I am really grateful to u for sharing this basic recipe and I will continue to use this recipe and recommend my friends to try it too. I will also continue to use ur other recipes featured in ur blog. Thanks HHB for ur response. Like u, I was very much lured into bread baking. As I discovered more and more how creative and artistic bread making can be, I was however, quite unwilling to expand too much energy into the kneading of dough by hand. Hence, I recently invested almost S$1K into owning a quality stand mixer. I was amazed to see how useful my new stand mixer helped me in the kneading job. FYI, I used my stand mixer first time to knead this dough recipe. Now making bread is a breeze to me which in time to come, I can try many different bread recipes without any physical side effects other than the effect of expanding waistline, haha! Thnx for ur response. Yes, a stand mixer, esp. one which has high power (mine is 1400W) with a quality bread dough hook for kneading is capable of performing any kneading. Moreover, a powerful stand mixer has more functionality compare to a bread machine. Bread machine might get jamed if bread ingredients contain fibre veins, eg. sweet potato, etc. as the veins might gets stuck in the knife. That was why I opted for a stand mixer. Anyway, I let my oven do all the baking, eg. buns, pizzas, hence, I am not limited to just baking loaf which bread machine does aside from kneading. I wud like to use this recipe again but this time I wud like to incorporate wholemeal flour into the loaf. Are u able to advise me for the main dough, how much of wholemeal flour I shud add to it and how much of the bread flour shud minus off. I know u do hv other wholemeal bread recipes in ur blog but I just love using the 'back to basic' recipe again as this is a keeper recipe to me. hi Priscilla, I have not tried using wholemeal flour for this recipe so I am not able to recommend the amount...the texture will be affected as wholemeal flour will absorb more water. There is a wholemeal version from this same cookbook, you may want to check it out...should be able to google for the recipe from blogs. Hi I loved your bread, it looks so soft and fluffy and the texture is very beautiful. This recipe is a keeper. Lately I've been on a bread making frenzy and been trying different methods to see which one yields the best bread. Thanks for sharing. I am a newbie baker. Like your blog very much. Can you please explain on your step 5 and 6 in details. If you could provide picture to show it would be better! TIA!! Hi HHB, thanks for providing me the link to have a better idea of rolling and flattening the dough. I tried yesterday with my Zojirushi Breadmaker. The dough function is a total of 1hr 30 mins inclusive of kneading, 1st rise, kneading 2nd rise. So after everything i remove the dough and punch out the gas and shape it to three ball shape (not according to your mention swiss roll style)and put it to rise again. after rise till 80% pullman tin covered. i bake in the preheated oven for 40 mins 190Deg. Viola! Although the bread did not come out in a square shape it remains as the shape when it is 80% rise. It's still soft fluffy and so tasteful!! Btw, how do i know whether my bread is ready to remove from the oven? Btw do you know why my bread remains as the 80% size after baking? Hi Vion, do u use an oven thermometer? I suspect your oven was not preheated to the right temperature. The bread should expand ver soon after you put it in the oven (within the first 5 mins). To check whether bread is ready, first by visual, the bread should expand and the crust golden brown. After unmould, tap on the base/bottom of the loaf, u should hear a hollow sound. how to make the bread softer and whiter ???? May i know where did you bought your bread tin? Hi, i got it from Sun Lik. Hi, you just need to gather the dough together to form a rough dough, just fold and knead a few times and it should come together. The dough is rough and dry/hard not soft. I've tried your recipe. It's superb!! However, can I know how long can i keep the unused portion of overnight dough? Hi Teng, I kept it no longer than 2 days. I tried to use up asap. Hi HHB, thanks for reply. I've just used the overnight dough which I've kept for about 3 days before your reply. Keeping fingers crossed that bread will come out fine.